When I saw this recipe from Sally's Baking Addiction on Pinterest, I knew I had to try it. I bought everything we needed (and had a few things on hand), but we actually ended up changing it a bit based on the taste. 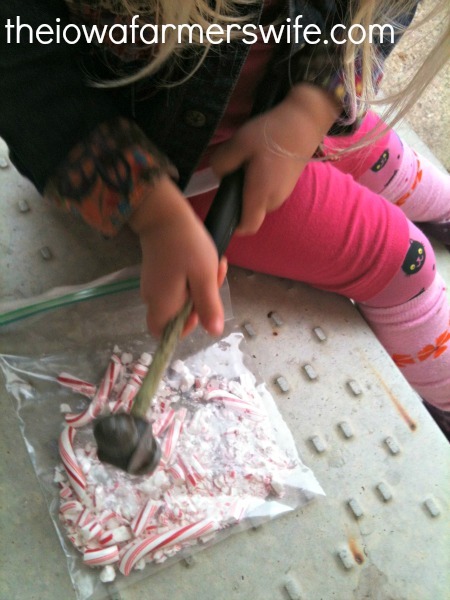 We used a lot less sugar and let the powdered candy cane sweeten it up! It's fairly simple and doesn't require baking (gotta love that!). You don't HAVE to refrigerate it after you're finished, but I highly recommend it straight out of the freezer! Give your preschooler the job of opening and breaking up your candy canes (seriously. it takes forever and she LOVED it). To crush them, you can either give your preschooler a hammer and have her crush the candy canes (in a baggy) or you can put them in a mini food processor. We tried it both ways because hammering put holes in our baggy! Crush them until you have both powder and chunks of candy cane. Place in a pourable measuring cup. Pour 7 cups of cereal into a large bowl. Microwave Almond Bark until it's of pourable consistency (I've found that heating it for 90 seconds in 30 second intervals works well). Pour bark on to cereal and stir until coated. Transfer to a large plastic baggy. 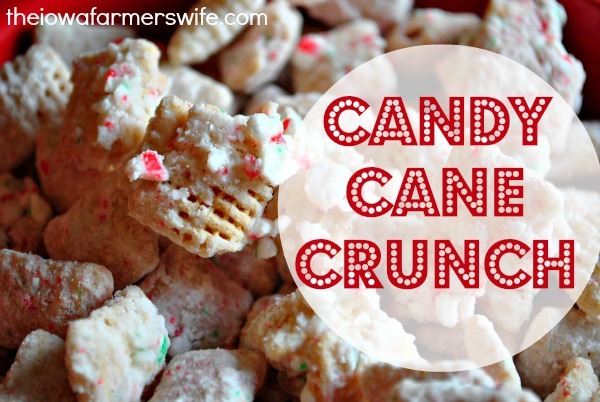 Dump candy canes and 1/4 c powdered sugar into the bag. Hand it off to your preschooler and shake, shake, shake it! Toss it in the freezer for 15 minutes, then NOM! NOM! NOM! Store in plastic baggy in the freezer or divide it up to give away. We used cellophane pouches and mason jars. Tie a cutesy bow around and voila! insta-gift. 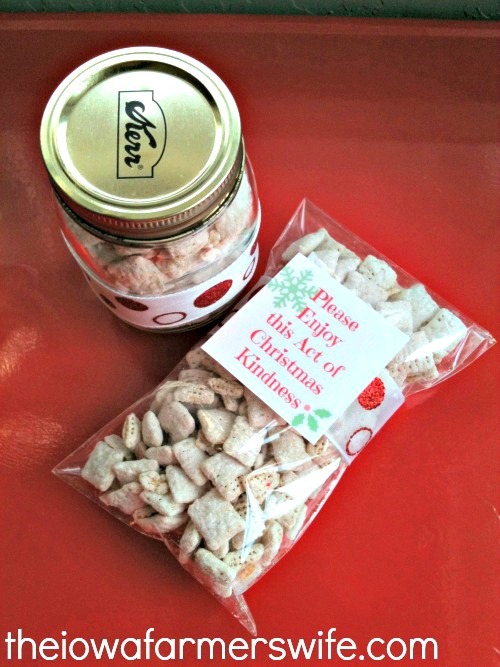 This treat makes a great gift for friends, neighbors, AWANA teachers and babysitters!